Edgar Wright and Simon Pegg wrapped up their “Blood and Ice Cream / Three Flavours Cornetto Trilogy” last year with the release of The World’s End. For those unfamiliar, the first two thirds of the trilogy were comprised of 2004’s Shaun of the Dead and 2007’s Hot Fuzz. It’s a damn near perfect geeky trilogy, but we were kind of sad to see it wrap up after all those years. Well, now Shaun of the Dead is — appropriately enough — coming back to life in 2015…but not in the form you might expect. Every time the credits roll for Edgar Wright’s Shaun of the Dead, it’s some of the saddest minutes in cinema, as we have to live with the fact that we’ll never see Shaun and Ed have new adventures. But wait, the hit animated series Phineas and Ferb has quasi-resurrected the duo for an upcoming episode, and we have the first look at the zombie bashers in full cartoon glory. The episode, called “Night of the Living Pharmacists,” is inspired (believe it or not) by Night of the Living Dead, and centers on the vaguely evil Dr. Doofenschmirtz’s latest invention, which accidentally turns almost the entire population of Danville into braindead Doof-zombies who are able to pass on their wide-eyed plague just by touching others. You’d think that having more pharmacists in the world wouldn’t be a bad thing, but these guys are only prescribing…pain? I’m not quite sure what they’re doing. Just because Edgar Wright’s so-called Three Flavors Cornetto Trilogy is over doesn’t mean we’re magically going to stop loving them. They’re too good for that. 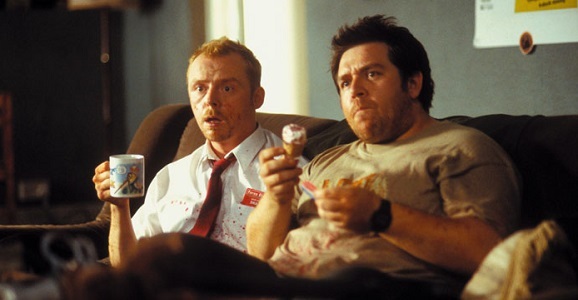 Those three loosely related siblings—thematically connected rather than plot or story wise—may be done, but we can still celebrate the awesomeness that Wright and co-conspirators Simon Pegg and Nick Frost brought into the world. And one way to do it is with action figures. Of the three films—Shaun of the Dead, Hot Fuzz, and The World’s End—only the first and the last really fall into the sci-fi category, but that’s okay, we still love you Hot Fuzz. And we’re far from the only fans wandering around out here. Evil Corp has now created these three sets of figurines to commemorate the films, and they are pretty damn fantastic. Each set pairs Pegg and Frost’s respective characters, bringing them together again, and for you to control this time. Somebody pop open a champagne bottle and fill it with beer, because two sets of best friends are meeting up for what is sure to be one of the greatest Halloween specials ever made. (Keep looking for that Great Pumpkin though, Linus.) 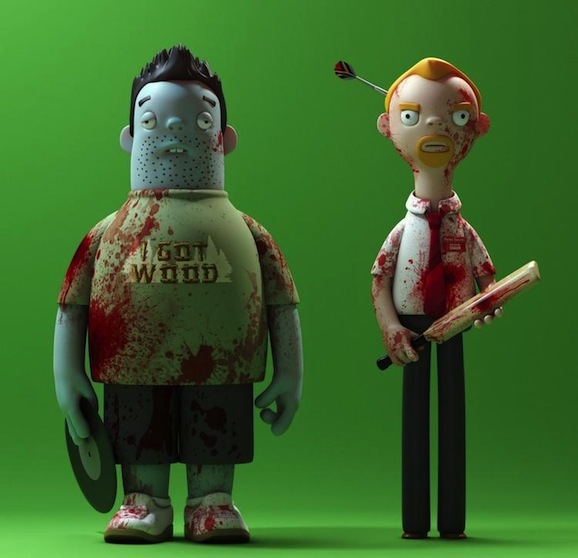 Simon Pegg has revealed he and frequent collaborator Nick Frost will once again slip into what are arguably their two most memorable roles, with Shaun of the Dead set to invade the world of Disney’s Phineas and Ferb in October. How’s that for a slice of fried gold Halloween candy? Sadly, no details about the episode have been revealed other than the characters’ presence within the holiday special. This is almost better, as it allows speculation to run wild. Will this episode follow any kind of canon within the Shaun of the Dead universe? If you recall, the film ended with Frost’s character Ed as a slightly rehabilitated zombie (he could at least play video games), but that doesn’t give Frost a lot of room to have fun with the voicework, so here’s hoping he’s back to his normal pot-smoking, record-throwing self in animated form. If they turn him back into a zombie within the show itself, that’s perfectly fine, too. It appears I’ve just gotten a memo confirming that my lack of involvement with this episode makes all of my wishes moot.